ESA Science & Technology: Jupiter: A cloudy mirror for the Sun? Astronomers using the European Space Agency's XMM-Newton telescope have discovered that observing the giant planet Jupiter may actually give them an insight in to solar activity on the far side of the Sun! 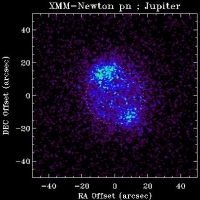 In research reported in the most recent edition of Geophysical Research Letters, they discovered that Jupiter's x-ray glow is due to x-rays from the Sun being reflected back off the planet's atmosphere. "We found that Jupiter's day-to-day disk x-rays were synchronised with the Sun's emissions," says Dr Anil Bhardwaj, from NASA Marshall Space Flight Centre and lead author on the paper. "Unfortunately, we missed a relatively large solar flare during the 3.5-days observation due to the perigee passage of the XMM-Newton". "But, still we were lucky; particularly clear was a signature of a moderate solar flare that went off during the observing period - there was a corresponding brightening of the Jovian disk x-rays", says Anil Bhardwaj. In addition to supporting the researchers' theory, this result has another application - in studying the Sun. 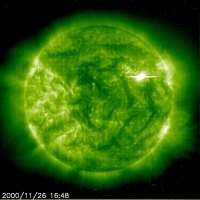 The Sun is a very dynamic environment and processes there have an impact on human activities. For example, solar flares (the most powerful explosions in the solar system) can damage satellites or injure astronauts in space, and on Earth they can disrupt radio signals in the atmosphere, so it is important to understand as much as we can about them. There are several dedicated spacecraft watching the Sun (such as the European Space Agency's SOHO satellite), as well as ground-based telescopes, but there are gaps in coverage as some areas of the Sun are not visible by any of these means at some times. "As Jupiter orbits the Sun, we hope to be able to learn more about the active areas of the Sun we can't see from Earth by watching the Jovian x-ray emissions," says Dr Graziella Branduardi-Raymont from the University College London's Mullard Space Science Laboratory. "If a large solar flare occurs on an area of the Sun that is facing Jupiter, we may be able to observe it in light scattered from Jupiter, even if we cannot see that region of the Sun from around the Earth at the time." 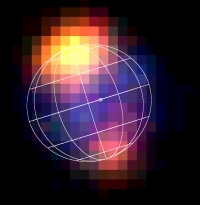 Jupiter's atmosphere is not a perfect mirror of the Sunlight in X-rays - typically one in a few thousand x-ray photons (packets of light) is reflected back, but the more energetic the photons, the more are reflected into space.